Illustrated in Keyes, The Theatrical World of Osaka Prints, 1973, pp. 72-73. Another version of these two prints in the Lyon Collection show the publisher's seal for Wataya Kihei. This one does not. 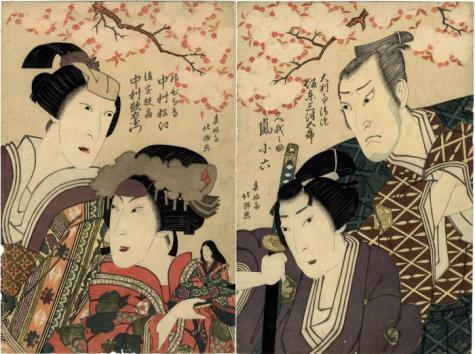 The left panel is illustrated in color in Ukiyo-e Masterpieces in European Collection 5: Victoria and Albert Museum II, Kodansha, 1989, #150.